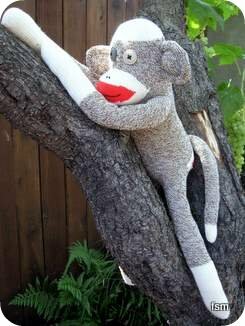 Make yourself a genuine handmade sock monkey toy with original Rockford Red Heel Socks. The sock elephant and sock monkey instructions are included in the packaging. The socks are available in brown, pink and blue. It's the red heeled socks from Fox River that create traditional looking sock monkeys and other sock animals. There is a great range of sizes. You can buy pairs of Red Heel Socks in mini (toddler size), small, medium, large and X-large sizes. The three official colours of the Rockford Red heel are; blue heather, pink heather and brown tweed. 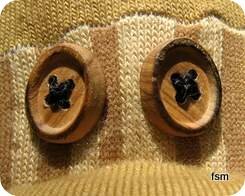 I made the sock monkey below out of a pair of brown tweed socks. 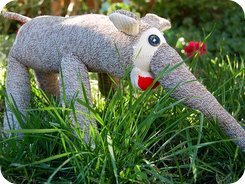 The main thing to remember when you get socks to make sock doll out of them is, the bigger the sock, the bigger the sock monkey. Makes so much sense really, doesn't it! I personally like to use the medium and large sized socks. 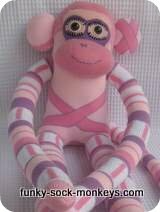 I did make a sock monkey out of small socks once but it was so fiddly and the result was a 'small' monkey, of course! I just feel like I get more bang for my buck using the bigger socks. 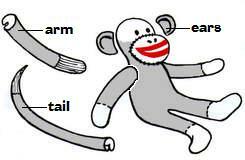 Making a sock doll is relatively easy and everything you need to know about how to make a monkey or an elephant arrives with the socks (on the packaging). 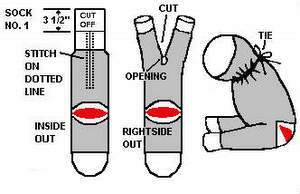 You actually don't need a pattern as such, just directions on where to cut your socks, you can get the free sock monkey and sock elephant directions right here . These instructions are the same as the instructions you would receive on the packaging of Rockford Red Heel socks. 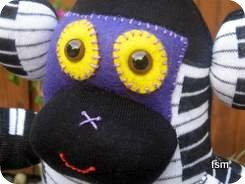 I love Rockford socks and have made many funky sock monkeys with them! They really are very strong. If they can handled the rough and tumble of being played with by my boys, then they must be strong. I do have to remind them not to play tug of war with the monkeys, and I am impressed the arms, legs or tails have never been yanked off - so far at least!. 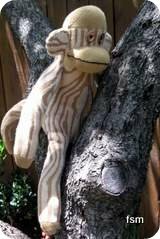 What is great about using the same type of socks to make lots of monkeys, is that even though you follow the same pattern and sew them together the same way, they all seem to come out the other end of the process with their own unique personalities. 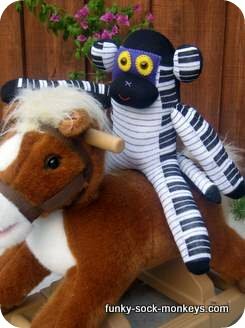 I have made so many sock monkeys now and that always seems to be the case. Honestly, some have come out so ugly they were even more awesome. I gave a lot away before I took photos otherwise I could have shown you what they looked like.